The Slogan Tee: Styling tips! When it comes to dressing, the current season is the ideal to try anything that can make you feel cool and comfortable by the minimum clothes possible. It is the best time of the year to bring out your own styling creativity. Whether it is a jumpsuit, a thin shrug, a cotton maxi or a kaaftan, you have a big variation for the styling. So, the question is how should you wear The Slogan Tee? They’re coming back full force this season. you can style it up now, down they’re waiting and ready to add some serious enhancement to your look! Dress it proud by following the styling tips below and get heads turning! The classic tucked in slogan tee looks fire too! You must be thinking that what to tuck it into? Well you have a lot of ideas for what you can wear with a salogan tee. It can look lovely with Karmen paper bag trousers, by Rebellious fashion. these pants are ultimate style goals and really elongate the legs. You can take some inspiration from how shauna boylann’s look Eleanor Slogan Tee! Tucking your tee in your skirt is a fabulous idea too gals! Whether it’s for a casual or a dressed up occasion the slogan tee and skirt combo can make for an eye catching look! You can also fold it up and pair with a cute bra-let for another take on this look. Oversized tee’s look best with a knotted look. 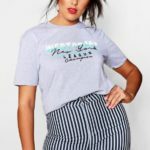 Style your slogan tee by tie-ing it up gal! This can be done super easily plus this knotted look instantly crops your tee and makes it look super cool! Style with a skirt or shorts and heels to work this look on a night out or a hang out. The Claudelle Shorts by Rebellious fashion are super popular and are on trend this season and look amazing with a knotted slogan tee. Style Tip – Match a pop of color from your tee to the color of your shorts to make for a sweet AF look. We are seriously crushin’ on how @itstabbytemporal has styled this combo. If Knots and tucked looks are just aren’t for you then don’t worry! The humble day to day look is a nice option too. Skinnies and flats will forever rock and this combo styled with a slogan tee looks effortlessly cool. You can try it either for a Shopping trip, or a Girly lunch. Just put your trusty jeans and slogan tee on – you’re ready to go! Naomi genes nails this causal cool look and shows how you can too! Have your say gals, how do you dress yours? Thanks for reaching out. I look forward to receive response from you on my site in future too. lets collaborate. I will also think about writing a blog about your site’s products. All you need to do is keep liking, commenting and sharing posts from http://sizzlingmagazine.com/.